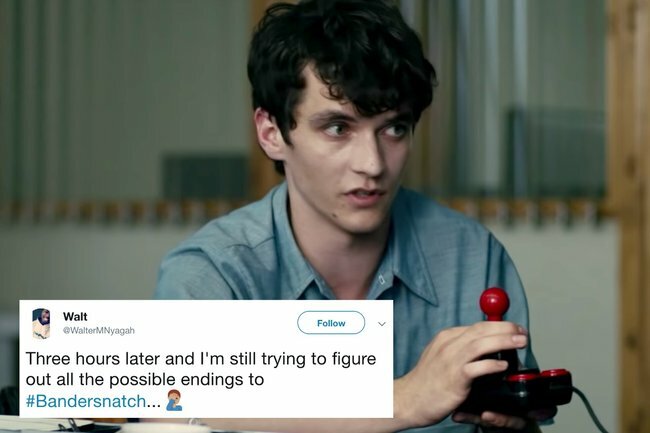 19 reactions to Black Mirror's Bandersnatch that sum up the experience. 19 reactions to Black Mirror's interactive episode that people can't get their heads around. Netflix’s latest choose-your-own adventure instalment of Black Mirror is here to take over your life. The 90-minute horror movie is titled Bandersnatch and follows Stefan, a video game designer, as he adapts a fantasy novel that led a man to murder his own wife, into a video game. Things quickly start to go wrong, and slowly Stefan begins to mentally unravel. There are five possible endings available to the viewer, with more than a trillion option combinations throughout the game. Your choices range from the inane, like picking which cereal Stefan eats, to much darker, plot-altering twists. Watch the trailer for Bandersnatch and prepare to be spooked. Judging from Bandersnatch’s initial reviews on social media, the program is gripping, macabre and easily addictive. Although you can finish the film in around 40 minutes, the average is around 90, with some viewers spending hours cycling through the many options. A very dedicated contingent of the internet has also created a flowchart with all the potential endings and variations, should you want to spoil the experience. Otherwise, here are all the best reactions to Bandersnatch so you can see what all the fuss is about. Netflix: bury body or chop up body? Stefan : ME AND MY FRIEND FROM THE FUTURE!! Today’s plan was to assess my life after gaining the Christmas stone but instead I watched Black Mirror #Bandersnatch TWICE and #BirdBoxNetflix. Where do you even start with either of them ????‍♂️???????? Have you watched Bandersnatch? What did you think? Tell us in a comment below.